As 2019 beings, startups in the InsurTech industry will continue to shape the insurance field. However, it’s not only about startups but also the technological innovations that emerge with different industries and the effects these industries have on insurance. 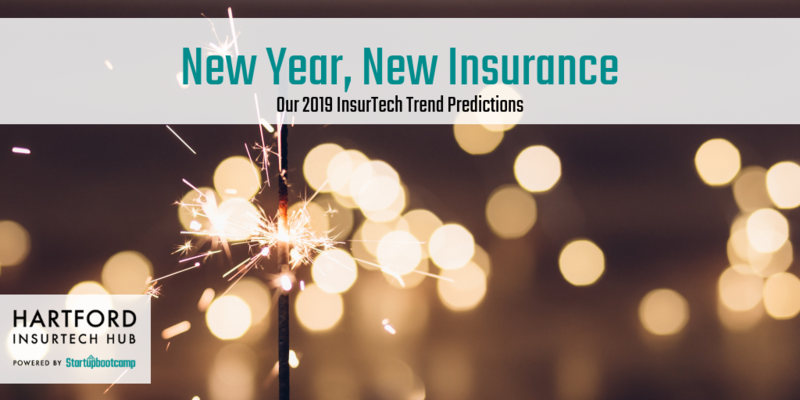 Here’s our theory on what we think the trends will be for the upcoming year and make sure to let et us know what you think the 2019 insurance trends will be. Cyber insurance will become more important. Yes, there may not be a large amount of data available, pricing cyber risk remains challenging. Once priced, the exposure is still dependent on the organizations’ employees. Sander Verloop, Risk Engineer at HDI Risk Consulting, figures that “60 to 90 percent of the incidents are based on human error,” which makes employee training a key component of cyber cover. We believe that start-ups which focus on the cyber threat will move into the limelight in 2019. Insurers will require a lot of server space and IT framework in order to fully utilize big data, AI and machine learning technologies. At the same time, this can be limited by organizations’ not being able to move workflows into the cloud. The big question will be how regulatory obstacles can be overcome as more insurers are starting to drive back their legacy mainframe systems and begin increasing opportunity for cloud-based solutions. It’s a big challenge (think data security) and this is why how technology startups, big tech, insurers and regulators will tackle the issue. In 2018, we started to see the rise in blockchain technologies in the insurance space and we’re predicting that 2019 will be the year that blockchain takes off. Blockchain technology will become a necessity as we see the growth of fraudulent insurance claims and the increased need for trustworthy software, platforms, and encrypted data storage. One of the biggest issues that blockchain technology will solve is the high level of human error that happens when cooperation and coordination amongst many different players, and companies, happens. Blockchain will be implemented in fraud detection, file management, and sensitive data transmission – making blockchain a necessity in the upcoming year. Offering immediate, useable answers to questions that don’t require broker input is making it easier for consumers to understand the products that will work for their needs. Easing digital consumers into the process of engaging with insurers through the usage of AI chatbots is the way forward. Over the next 3 years, 75% of insurance firms are seeking investment in chatbot technology if they have not already established a relationship in the technology.